Two Styles, Two Ways of Being. In 1951, Princess Elizabeth, heiress of the throne of England, and Eva D. Peron, wife of Gerald Peron, president of the Argentine Republic, were indisputably the two most outstanding feminine figures in international political life. While very much a woman of the time from every point of view, Princess Elizabeth represented in an outstanding way a lady of the twentieth century formed under the influence of the tradition still alive above all in England. Her very authentic superiority is highlighted by the charms of her attractive and communicative affability. Her popularity was immense, rather unanimous, in England. There was opposition to the government of the time but not to the monarchy, and even much less against the smiling and enchanting heiress to the throne. Eva D. Peron also incarnated a style that was characteristic of her times, but entirely different from Princess Elizabeth. Unabashedly involved in political life, she exhibits an ardor and steadiness uncommon even among men. 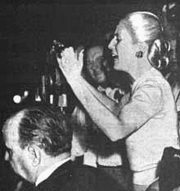 The former actress, and lively and resourceful popular orator, was regarded very coldly by the traditional families that cultivated the distinction and manners that made Buenos Aires society famous. Eva D. Peron was the idol of the organized labor movement of the “shirtless” masses with whom she was identified by all and in everything. One and the other, the Princess and the “leader” of the “shirtless,” represent ideas, principles, and different worlds, which at times clashed consciously and violently, sometimes imperceptibly but permanently in every country. Comparing then these two feminine figures considered, not personally but as types, is not comparing two nations, but two ways of being that exist in all countries. Would it be comparing two social classes? Not necessarily, because both “styles” can be found from the top to the bottom of the social ladder. For example, consider how Blessed Anna Maria Taigi, a simple cook employed by the Colonna princes in Rome in the nineteenth century, attracted the attention of passersby, not only by her piety but by her venerable bearing. One might also consider how all know poor rough inhabitants in the hinterland of our country presiding over the lives of their families with the nobility of the patriarchs of old. We insist: what stands out in this comparison is the difference between two “styles”- two ways of being. Blessed Anna Maria Taigi at San Crisogono in Rome. This entry was posted in Plinio Corrêa de Oliveira and tagged affability, Anna Maria Taigi, attractive, authentic, enchanting, Eva D. Peron, grace, ideas, Kingdom, monarchy, noble, Plinio Corrêa de Oliveira, Princess Elizabeth, principles, Refinement, Reign of Mary, Republic, Rome patriarchs, social classes, superiority by Plinio Corrêa de Oliveira. Bookmark the permalink.